How to Boil Lobster and Lobster Steaming Instructions | Cape Porpoise Lobster Co. Choose a pot large enough to hold all the lobsters comfortably; do not crowd them. A 4- to 5-gallon pot can handle 6 to 8 pounds of lobster. Fill with water, allowing 3 quarts of water per 1-1/2 to 2 pounds of lobster. Add 1/4 cup sea salt for each gallon of water. Bring the water to a rolling boil. Add the live lobsters one at a time, and start timing immediately. Do not cover. Stir the lobsters halfway through cooking. Let the lobsters rest for 5 minutes or so after cooking to allow the meat to absorb some of the moisture in the shell. Choose a pot large enough to hold all the lobsters comfortably; do not crowd them. A 4- to 5-gallon pot can handle 6 to 8 pounds of lobster. Put 2 inches of seawater or salted water in the bottom of a large kettle. Set a steaming rack inside the pot and bring to a rolling boil over high heat. Add the live lobsters one at a time, cover the pot, and start timing. Halfway through, lift the lid (careful—the steam is hot) and shift the lobsters around so they cook evenly. 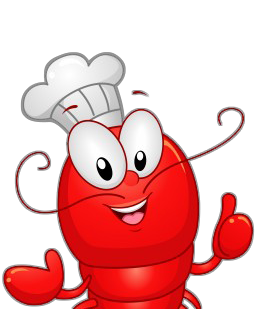 If they are new-shell lobsters reduce cooking time by 3 minutes. Cooked lobsters will turn bright red, but that’s not the best indicator of doneness, especially for large lobsters. They may still be underdone when the shell turns red. Jasper White recommends cooking lobsters for the recommended time, then cracking one open where the carapece meets the tail. If it’s done, the meat will have changed from translucent to white.